Family Literacy Day is a national awareness initiative created by ABC Life Literacy Canada and held annually to raise awareness of the importance of reading and engaging in other literacy-related activities as a family. Celebrate this January 27 with our list of Canadian books that celebrate and encourage reading as a family activity. What makes a family? 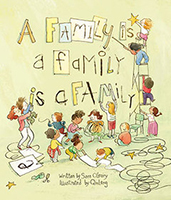 When a teacher asks her class to think about what makes their families special, the answers are all different in many ways — but the same in the one way that matters most of all. A warm and whimsical look at the great diversity of families and the bonds of love that matter most. Acadian Mémére and Scottish Nannie seem to have nothing in common, but their love for their grandchildren is a bridge that brings them together. 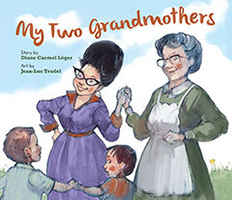 This picture book is a whimsically illustrated, heartwarming tale of the special relationship between grandparents and grandchildren, and a celebration of family of all shapes and sizes. This title is also available in French as Mémére Soleil, Nannie Lune. Anna and Oliver, big siblings extraordinaire, are here to tell you about what to expect when a new baby is on the way — and what life will be like when your baby sister or brother arrives! This story offers a funny, loving and reassuring peek into the life of a big brother and sister — with real information, helpful tips and kid-friendly humour! We sang you from a wish/we sang you from a prayer. 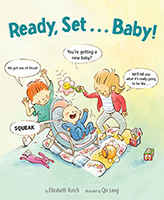 This sweet and lyrical board book captures the wonder new parents feel as they welcome baby into the world. 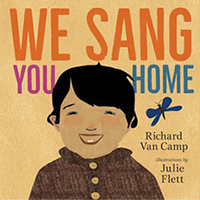 Julie Flett’s warm, evocative illustrations complement Richard Van Camp’s spare but emotionally effective text celebrating that special bond between parent and child. A perfect love song to share with little ones. Eleven-year-old Balthazar Fabuloso’s eccentric family of magicians actually have magic powers — all except Balthazar. So when the entire family, except Balthazar, disappears, the only Fabuloso without real magic must find them. Balthazar teams up with a long-lost lunatic uncle and the loathsome Pagan Fistula against a force so evil that even powerful magicians cower before it. What hope does a ragtag crew of misfits have? Every day, nine-year-old Yasmin borrows a book from Book Uncle’s curbside free lending library. But when the mayor tries to shut down the rickety bookstand, Yasmin must take her nose out of her book and do something. But what can she do? With the help of friends, family and neighbours, Yasmin launches a campaign to make sure the voices of the community are heard. Fred is grief stricken at the loss of his beloved dog, Casey. When Fred loses Casey’s worn tennis ball down a sewer grate, Fred goes down the sewer where he finds himself tumbling into a parallel universe. In this downside-up world Fred discovers his own family except… better. Best of all, Casey is alive! It’s a place where nothing gets lost. But can everything lost be found again? Meet the Fitzgerald-Trouts, a band of four loosely related children living together on a tropical island. They take care of themselves. They sleep in their car, bathe in the ocean, eat fish they catch and fruit they pick, and can drive anywhere they need to go — to school, the laundromat or the drive-in. The Fitzgerald-Trouts can do anything… maybe even find a real home. Jakub and Lincoln are best friends and graffiti artists. When Jakub gets a scholarship to an elite private school, it’s a chance for a better life, but he must leave Lincoln, who soon gets lured into the violent world of a gang, the Red Bloodz. Then Jakub is targeted and Lincoln must decide — save his friend or embrace his life as a gangster. Ana, 14, and her father have fled their Mennonite community in Bolivia and come to Toronto. Ana only knows that her father is trying to find her mother who disappeared years ago. Torn between worlds, and troubled by the things she and her father left behind, Ana is determined to find the one person who can tell her what they are running from — her mother. Declan’s life in small-town Quebec is a series of let-downs — from his parents’ divorce, his delinquent brother and his own lacklustre performance at school to the real kicker — his father’s five-year absence. Then he meets Leah, whose grandmother is a Holocaust survivor, and he begins to see how rage has permeated his life. Slowly Declan begins to rebuild a relationship with his father.